five + three = Required Please enter the correct value. 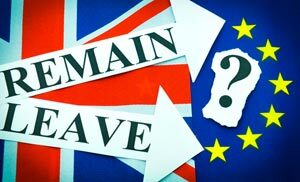 Dow Jones Industrial Average News, 6/21/2016: Markets have moved in tandem with polling sentiment around the possibility that British voters could push England out of the European Union. That puts the focus on undecided voters. Expect the chatter and campaigning to heat up again on Tuesday as warnings about a potential recession or outright economic collapse are sung from the Brexit's biggest critics. But the Brexit isn't the only big news happening in the markets this morning. Here is today's top stock market news, stocks to watch, ways to profit, and economic calendar for June 21, 2016. Dow Jones futures projected a 65-point gain as investors anticipate that the United Kingdom will remain in the European Union. Momentum has swung back in favor of those who wish to remain in the world's largest economic bloc. Economists have warned of a "Black Friday" trading session in the event of an exit. Meanwhile, George Soros said this morning that a Brexit would could cause a significant drop in the pound and make the British poor. Here's how you should be trading the Brexit. Crude oil prices slipped as traders took gains off the table ahead of Thursday's Brexit vote. Yesterday's trading session saw modest gains, but caution has set in. WTI crude was off 1.6% this morning, while Brent crude was down 1.7%. The U.S. Federal Reserve is in focus today as Fed Chair Janet Yellen visits Congress. Yellen will be testifying before the Senate Banking Committee and discussing the Federal Reserve's proposed timing for its next rate increase. Following the Fed's decision to not raise interest rates in June due to Brexit and other macro-economic fears, expect Congress to press Yellen on the state of the U.S. economy. Congress will want to know more about slow April and May job growth, as well as the Fed's monetary policy decisions. Don't expect any surprises, as Yellen has dropped her hawkish tone in recent weeks. One thing is for certain: The Brexit could fuel an end to the jobs of central bankers like Janet Yellen. On the deal front, Tencent Holdings Ltd. (OTCMKTS: TCTZF) announced that it will purchase the majority stake of Finnish mobile game maker Supercell. The Chinese firm will buy the stake from SoftBank Group in a deal that could push Supercell's valuation above $9 billion. Speaking of China, shares of JD.com Inc. (Nasdaq ADR: JD) pushed up another 1.8% a day after announcing it would purchase the Chinese e-commerce division of Wal-Mart Stores Inc. (NYSE: WMT). This is just the latest sign of growth for the nation with the world's largest consumer base. If you really want to tap into the huge profits that are being fueled by China's significant growth, be sure to read about this company as well. Shares of Facebook Inc. (Nasdaq: FB) were in focus this morning after its annual shareholder meeting concluded on Monday. During the meeting, the company's shareholders retained the controversial Peter Thiel on its board. Thiel has been the subject of headlines after he helped bankroll a major lawsuit against online publisher Gawker, which recently declared bankruptcy. Shareholders also voted on a stock split, and here is what you should do now. The deal is done, and shares of Boeing Co. (NYSE: BA) were pushing higher again on Tuesday. The global airline giant announced a potential deal worth $25 billion to sell aircraft to Iran Air. This is the first deal that the state of Iran has made with a U.S. company following the lifting of sanctions over its nuclear program. Lennar Corp. (NYSE: LEN) gained more than 2.5% after the company reported stronger than expected earnings. The Florida-based homebuilder reported earnings per share (EPS) of $0.95, topping Wall Street estimates of $0.87. Other companies reporting earnings today include FedEx Corp. (NYSE: FDX), Adobe Systems Inc. (Nasdaq: ADBE), KB Home Corp. (NYSE: KBH), and La-Z-Boy Inc. (NYSE: LZB). Federal Reserve Governor Jerome Powell speaks at 2:30 p.m.